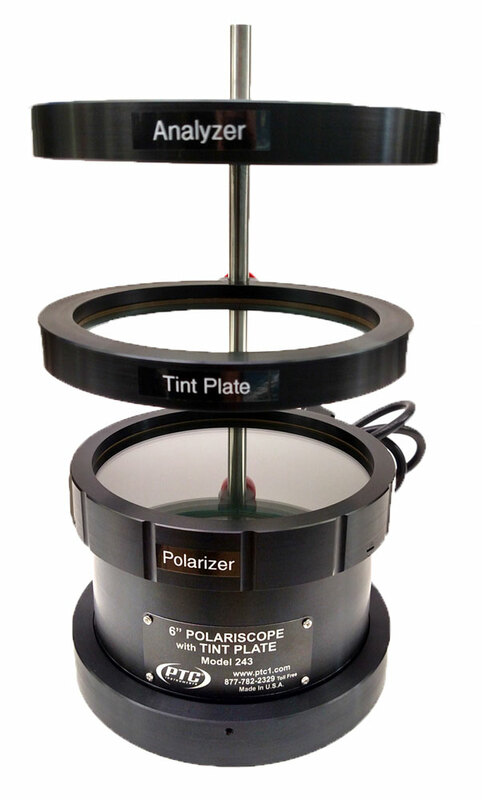 The Polariscope is an essential tool for determining strain patterns developed during fabrication and manufacturing. It permits immediate determination of strains in most transparent materials. It is valuable in production or as a laboratory tool wherever glass is fabricated, welded or bent. Check the liquid in glass thermometers for stress and strains. As polarized light travels through strained glass or plastic, it undergoes a retardation proportional to the amount of stress. A Polariscope is an instrument which can be used to qualitatively view this retardation. Tech Note: When a photoelastic material is subjected to a load and illuminated with polarized light from the measurement instrumentation (called a reflection polariscope), patterns of color appear which are directly proportional to the stresses and strains within the material. The sequence of colors observed as stress increases are: black (zero stress), yellow, red, blue-green, yellow, red, blue-green, yellow, red, etc. The transition lines seen between the red and green bands are known as "fringes." The stresses in the material increase proportionally as the number of fringes increases. Closely spaced fringes mean a steeper stress gradient, and uniform color represents a uniformly stressed area. Hence, the overall stress distribution can easily be studied by observing the numerical order and spacing of the fringes. Power............................ 115-125V AC or DC, 7 ft. cord. Loosen the red knob. Slide the Analyzer towards the top of the Support Rod. Tighten the knob. Slide the Tint Plate up the Support Rod, giving enough clearance to place your sample between the Polarizer and the Tint Plate (which is at the top of the Base Assembly) and the Tint Plate. Plug the cord into a standard 115-125VAC outlet and turn on the unit s light source with the switch on the Base Assembly. Place the sample to be viewed on top of thePolarizer Ring. Using the Tint Plate will show the strains in color. If desired, swing the Tint Plate out of the way for a black & white image. Rotating the Polarizer Ring will adjust the contrast/brightness. The ring can be rotated a full 360°. The color balance/hue can be adjusted by rotating the Tint Plate .